Largehearted Boy: Book Notes - Chris Cander "Whisper Hollow"
Book Notes - Chris Cander "Whisper Hollow"
Chris Cander's inspired novel of love and community Whisper Hollow spans generations in the harsh world of West Virginia coal mining country. "Cander divinely delves into multiple points of view, crafting a collage of vibrant, layered characters while charting six decades of poignant, precise moments. A distinctive novel that sublimely measures the distressed though determined heartbeat of a small mountain community." Although I have no gift for playing any kind of instrument—including my voice—I try to harness the power of music in my novels. In fact, I am a writer probably because I can't be a musician. Victor Hugo said, "Music expresses that which cannot be said and on which it is impossible to be silent." It mediates the spiritual and the physical worlds. 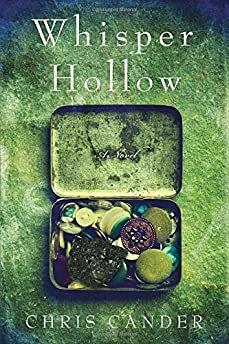 In Whisper Hollow, where the spiritual and the physical are often at odds, the presence of music in the story—whether actual or implied—seems essential. Here is a playlist in two parts. The first corresponds to specific scenes in the novel, and the second is related in general to the setting, which is a fictional coal mining town in southern West Virginia. Mendelssohn's Violin Concerto in E minor, Op. 64. In the chapter in which Myrthen's husband John Esposito joins the Army, he goes to London on leave. There he meets Siobhán McCutcheon, a French-Irish street violinist, who plays this piece. An unusual feature of this concerto, which Mendelssohn completed in 1844, is that he dispenses with the usual orchestral introduction and brings in the soloist right away. John sees Siobhán as she is in the throes of this energetic first movement. Gradually, the soloist's music subsides, forming a bridge passage to a calmer theme—which parallels what happens to John in this pivotal chapter. "I'll Still Go on Wanting You" by James Melton, released in 1929. This speaks to the unrequited love held in the hearts of several of the characters early in Part One of the novel: Alta for John, John for Myrthen, Walter for Alta. It applies again later, in Part Two, after John and Walter are dead, and Alta is left to mourn them both. "I'll keep your photograph deep down in my heart. And though we're apart/I'll always remember/All that I have I'm giving/I'll live but while I'm living/I'll still go on wanting you." "My Dreams Are Getting Better All The Time" by Les Brown. There's a chapter titled July 7, 1945, in which Alta and John, early in their love affair, are at a company-sponsored dance. A band does their own renditions of popular songs, and though I didn't name any, I was thinking of this one as John and Alta orbited one another around the floor, trying to hide their feelings from those around them—including Alta's husband, Walter. "If You Could Read My Mind" by Gordon Lightfoot. This ballad is essentially about the failure of a marriage. Although the fictional scene took place twenty years before the actual song was released, I can imagine Walter thinking something like this as he was dictating his final note to Alta just before he and her lover died together in a collapsed mine shaft in 1950. "If you could read my mind, love/What a tale my thoughts could tell/Just like an old-time movie/'Bout a ghost from a wishin' well/In a castle dark or a fortress strong/With chains upon my feet/You know that ghost is me/And I will never be set free/As long as I'm a ghost that you can't see"
"Requiem Mass" by Franz Liszt. I'm thinking of an unwritten chapter—the funeral Mass and burials of the fallen miners. Myrthen would probably have chosen this arrangement by Liszt, not only because of its liturgical appropriateness, accessible level of difficulty, and the limitations of her 8-stop organ, but because this Hungarian piano virtuoso received minor orders, though he did not make it all the way to the priesthood. "Lydia" by Slaid Cleaves. In the chapter titled November 7, 1950, it's been exactly one month since Alta lost her son, husband and lover in a fatal mine explosion. She is sitting at her table, reflecting on her loss. It will be nearly seventeen years before she meets the young woman—named Lydia because of this song—whose friendship enables Alta to begin to heal. There are significant parallels in the lives of these two women, some of which were inspired by these lyrics. "Oh Lydie, let him go. The boy is gone/Her mother struggled as she tore him from her arms/Oh Lydia, your tears are heaven's rain/But she never was the same." "The End" by The Doors. In 1967, when this song was released, Alta had been alone for almost two decades, living a sort of half-life in the cabin that had belonged to John. There's an elegiac drone to Jim Morrison's voice and lyrics that reflects a kind of madness related to the end of a love story, or the intolerability of heartache, or the essence of self. I imagine that Alta may have been going a bit mad, having been alone so long with her grief. "Desperately in need, of some, stranger's hand/In a, desperate land/Lost in a Roman wilderness of pain/And all the children are insane, all the children are insane/Waiting for the summer rain, yeah." "Working in a Coalmine" by Lee Dorsey. It was released in 1966, but the message—"Lord, I'm so tired/How long can this go on? "—is applicable throughout the novel's six decades. "Green Rolling Hills" by Emmylou Harris. This Bluegrass ballad is an ode to the region's particular combination of natural beauty and dearth of opportunity. "The green rolling hills of West Virginia/Are the nearest thing to heaven that I know/Though the times are sad and dear and I cannot linger here/Theyll keep me and never let me go." "Coal Miner's Daughter" by Loretta Lynn. This song was released in 1969 and became Lynn's signature song, telling the hardship story of growing up poor in Butcher Hollow, Kentucky. "Country Roads" by John Denver. This was my mother's favorite song, and I can vividly remember her singing it along with the record player while she cleaned our house in Texas. Her devotion to her home state is what inspired the setting for Whisper Hollow. "Forked Deer" by Ed Haley. A soundtrack wouldn't be complete without some Bluegrass fiddling. Haley was born in Logan County, WV and was one of the best-known fiddlers in the region until his death in 1951. This year, he'll be inducted into the West Virginia Music Hall of Fame. Beautiful Night Sounds: Frogs, Birds, Cicadas, Owls. There's a YouTube channel, Relax with Nature, that features recordings of nature's ambiances. I wrote many of the scenes in Whisper Hollow while listening to such atmospheric pieces as this, especially when the scene outside my office window didn't match that of the particular setting I was trying to capture. In my imagination, this is what Whisper Hollow sounds like.